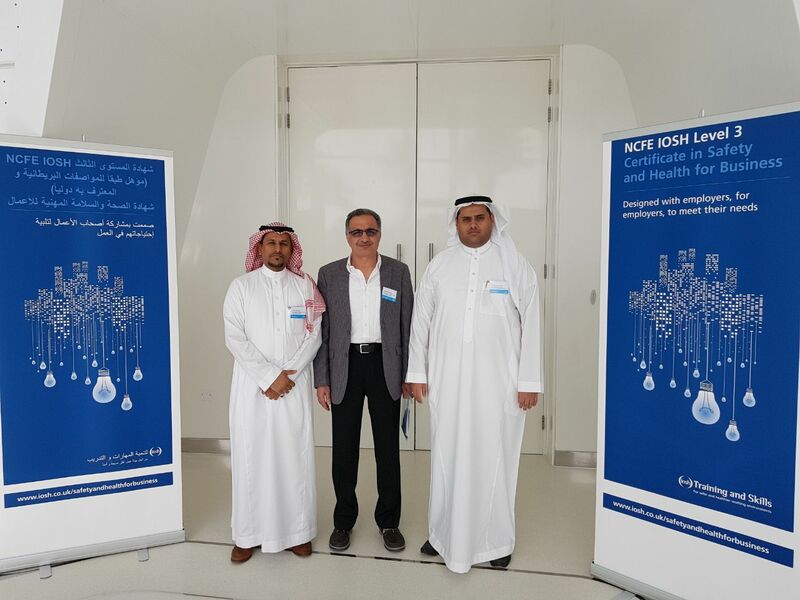 Umm Al-Qura Consultancy Oasis’ team, represented by Risk and Crisis Management Center (SAFE), participated in the Institution of Occupational Safety and Health Institute’s (IOSH) Program Presenters Forum. It was held in Abu Dhabi in the UAE during the period between April 24-25, 2018. This forum comes as a part of the British Institute’s programs 2022 to build strategic partnerships with the institutes, institutions and universities in the world in general and in the Middle East in particular. The purpose behind this is to develop programs and initiatives that are specialized in raising the level of occupational safety and health globally and meeting the global market’s increasing requirements in such field. SAFE Center has started earlier building this strategic partnership with IOSH Institute through a cooperation in presenting six specialized training programs. Dr. Ali bin Mohamed Al-Shaari, the Dean of the Institute of Research and Consultation Studies., noted that SAIF Center is delivering its message through offering the specialized expertise in providing consultations and training in the field of safety systems in the industrial, construction and general projects, in addition to the industrial security, planing, and dealing with risks, disasters and crises. It also works on preparing and presenting a number of programs, courses and consultation services, including specialized programs in developing and raising the efficiency of safety and security systems and implementing the quality standards. He added that the Center also provides consultation services and training in the industrial security, public safety and planing systems to face disasters and crises, in addition to consultation services and training in the international standards in planing and occupational safety and security policy making. He then lauded the support and consideration of Dr. Abdullah bin Omar BaFail, the President of UQU, for all the Institute’s initiatives and activities for producing, transferring and relocating the knowledges and technologies to contribute to resettling the leadership transformation programs for the sake of building and developing a world-class leading university. He highlighted that the partnerships with the global specialized bodies in the fields of safety, security, and risk and crises management are considered one of the most important SAFE’s strategic goals. As a result, partnerships were built and cooperation mechanisms were developed with the relevant bodies internally and externally, noting that within record time, accreditations were obtained from global organizations and institutions.